Countertop - Reverse Osmosis Alkaline/Ionizer ORP Water Filter System 100 GPD. Alkaline Oxidation Reduction Heavy Duty Counter Top RO Reverse Osmosis Water Filter System. The Alkaline Counter Top RO Reverse Osmosis Water Filter System employs a revolutionary plumbing-free design, mking access to Alkaline Oxidation Reduction Remineralizer pH enhancer easy and affordable to everyone. Attach the faucet diverter to your sink faucet and you are ready to go. 123 Water Filter 4 Stage Heavy Duty Reverse Osmosis 100 GPD Alkaline Oxidation Reduction. Reverse Osmosis product water is more acidic due to it's purity. By the time the water is processed through the various stages, after the reverse osmosis state, minerals etc has been removed. To replenish necessary minerals, the alkaline filter is recommended. The alkaline filter stage in this system, as reverse osmosis product water tends to be acidic due to the purity of the water. All minerals have been stripped from the water. To buffer the water to a more natural alkaline stage, and to add essential minerals back i.
Calcium, magnesium, potassium and sodium. This filter will increase the alkalinity without over correcting. This alkaline anti-oxidant filter provides abundant Active Hydrogen and also increases reduction power by increasing pH, making small water cluster and providing beneficial minerals. Negative ORP, which is produced with ionized alkaline water, severely retards the aging process. By Counteracting oxidation damage to our cells. It does this by hunting down free radicals in our system and neutralizing them. Negative ORP is a very powerful anti-oxidant, and is found naturally in orange juice, glacial runoff and deep underground uncontaminated aquifer or spring water. Reverse Osmosis, also known as hyper filtration, is the finest water filtration available today. It is the most treatment technology used by premium bottled water companies. It is effective in eliminating or substantially reducing a very wide array of contaminants, and of all technologies used to treat drinking water in residential applications, it has the greatest range of contaminant removal. Reverse Osmosis will allow the removal or particles as small as individual ions. Reverse Osmosis uses a membrane that is semi-permeable, allowing pure water to pass through it, while rejecting the contaminants that are too large to pass through the tiny pores in the membrane. Quality reverse osmosis use a process known as cross-flow to allow the membrane to continually clean itself. As some the the fluid passes through the membrane, the rest continues downstream, sweeping the rejected contaminants away from the membrane and down the drain. The process of reverse osmosis requires a driving force to push the fluid through the membrane (the pressure provided by a standard residental water system is sufficient - 40psi plus). Since membranes are subject to degrading by chlorine, iron, manganese, hydrogen sulfide and to bacterial attack, activate carbon pre-filter is included with your reverse osmosis system. RO systems are generally the best choice for water contaminated with high nitrite levels as migh be found in agricultural areas. Pre Sediment inline sediment water filter - Super Size 2.5"x12" - Dirt and sediment reduction. Pre Activated inline Coconut GAC water filter - Super Size 2.5"x12" - Chlorine, Taste & Odor Reduction. Post Alkaline Anti-Oxidation reduction water filter - Super Size 2.5"x12" - pH +, mineralization, alkaline. Includes EZ Faucet Diverter, Flow restrictor, Tubing, Spout. Connect and flush for 10 minutes and ready to go. Filters Service Life - 2000 Gallon. Membrane Service Life - 3 - 4 Years. Great Heavy Duty Countertop Reverse Osmosis System with Alkaline Antioxidant water filter. Average is either 4 or 3 : 1 Clean Water. Personal checks may be held until cleared. Return items must be in Original Condition and sealed packaging where applicable. We do not accept used or installed items. We do not mark merchandise values below value or mark items as "gifts". US and International government regulations prohibit such behavior. Drinking Water System when installed and operated within recommended parameters, with the exceptions stated below. How Long Does The Coverage Last? You must pay any labor charges. Drinking Water System that is damaged because of neglect, misuse, alterations, accident, misapplication, physical damage, or damage caused by fire, acts of God, freezing or hot waters or similar causes. How Do You Get Service? Used or installed items, items removed from original sealed packages will not be accepted for return. Any damaged item, please send us photo of the damaged item. The item "Countertop Reverse Osmosis Alkaline/Ionizer ORP Water Filter System 100 GPD" is in sale since Monday, June 13, 2016. This item is in the category "Home & Garden\Kitchen, Dining & Bar\Small Kitchen Appliances\Water Purification\Water Filters". 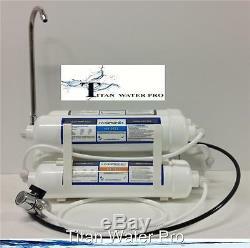 The seller is "titanwaterpro" and is located in Canyon Country, California.